Oh to be in Austria, now that January’s here. There’s no better way to start the year. After thirty years of having to ski in school holidays, it’s been a pleasure for us to get on a plane in mid-January, when the only children in sight are under five or have been sneaked out of school to get the cheaper price of a ‘low season’ week. We embark in Edinburgh with other senior skiers, their ski anoraks taken out for the annual airing on the slopes. Over the years, the sun has given ours a chequered look of designer fading, but they’re much too good to discard, and British too – remember the company called Phoenix? Clad in unfaded luminous green, our cheerful band of ski reps meets and greets in Innsbruck. They look as if they’re straight out of school and are full of superlatives. ‘Awesome!’ they cry, as someone hands them a pen for their checklist. Ignoring the high average age bracket of the clients on our coach, our rep insists on highlighting the truly excellent pubs and clubs to be had in our resort of Sölden. It will all be awesome, brilliant, incredible and more besides. I’d been to Sölden in 1977, when I lived in Munich. Some German friends were skiing there, and invited me down for the weekend, so I headed over the Alps in my Mini. 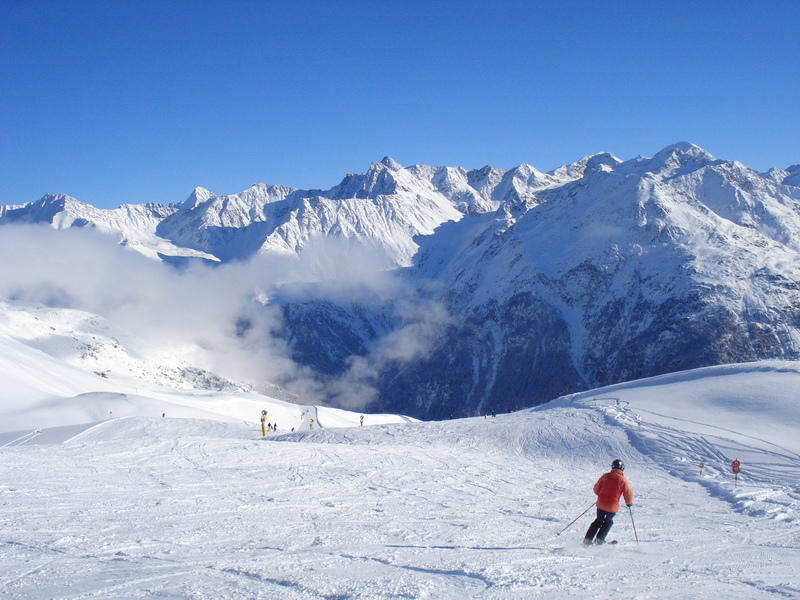 I wasn’t a skier back then, but they did take me up to Hochsölden and put me on skis, which I handled with no skill whatsoever. We went up in a single chair lift, and I have a memory of a blanket being thrown over my legs to keep me warm. Sölden now boasts the usual eight-seater gondolas and ‘six-pack’ chairs with heated seats and hoods to protect from bad weather. 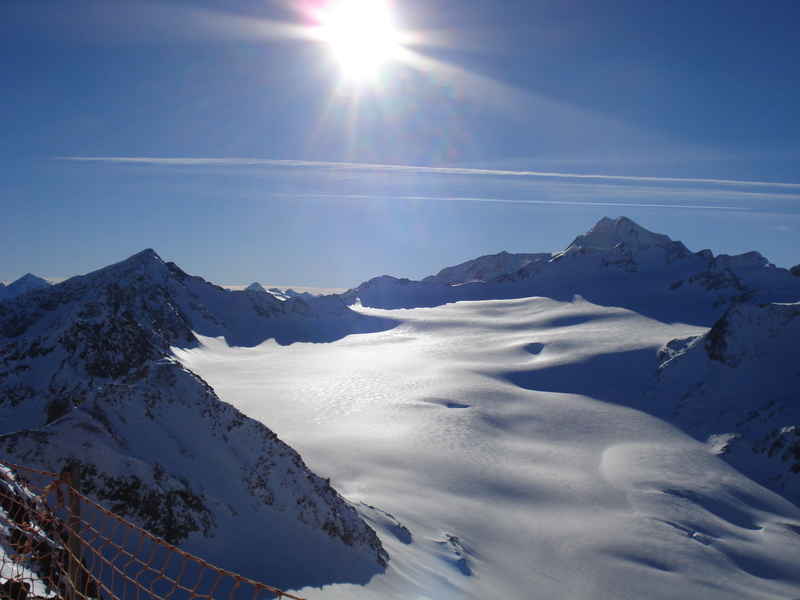 It’s a most impressive lift system, taking us right up to the Tiefenbach and Rettenbach glaciers at 3000 feet. The other big change is the clientèle. Back in 1977, the Germany where I lived was West Germany, and there was never a thought of meeting any Russians, Hungarians, Romanians – or indeed any East Germans. Now they’re all playing happily on the slopes of Sölden, and you’re as likely to find a menu in Russian as one in English. Our hotel was a bit of a linguistic mêlée. Our room maid was from Italy. ‘Buongiorno!’ we cried, on our way down to breakfast. ‘Smakelijk!’ said the Dutch waitress in the dining room. The dining room was like a line-up for the Eurovision Song Contest, with Ukraine to our right and Switzerland to our left. The Netherlands occupied the far corner, next to Russia, then came Germany and two more British tables. Mid-week we were treated to a special Italian buffet. German and English were the hotel’s in-print languages. The English had been fast-pressed by Google translate, which led me to think that a lot of non-native English speakers were learning some very wrong expressions and that this could lead to some interesting distortion of the English language in years to come. We were, for example, urged to ‘use water with parsimony’ in a crusade to help the environment. Unfortunately, we hadn’t packed any. Having said all this, it was one of the best hotels we’ve stayed in – small, friendly and family run, with spacious rooms, designer cuisine, a good wine cellar and a quiet location away from the pubs and clubs. You can’t beat Austria for this kind of establishment. Since my first visit to Sölden in 1977 I’ve learned to ski properly and get up some speed. Back then, the only speeding I did was on the way home to Munich, where I remember being fined 80 Schillings for a little too much acceleration through the village of Langenfeld. I don’t think there’s any better feeling than getting up some speed on a sunny day. 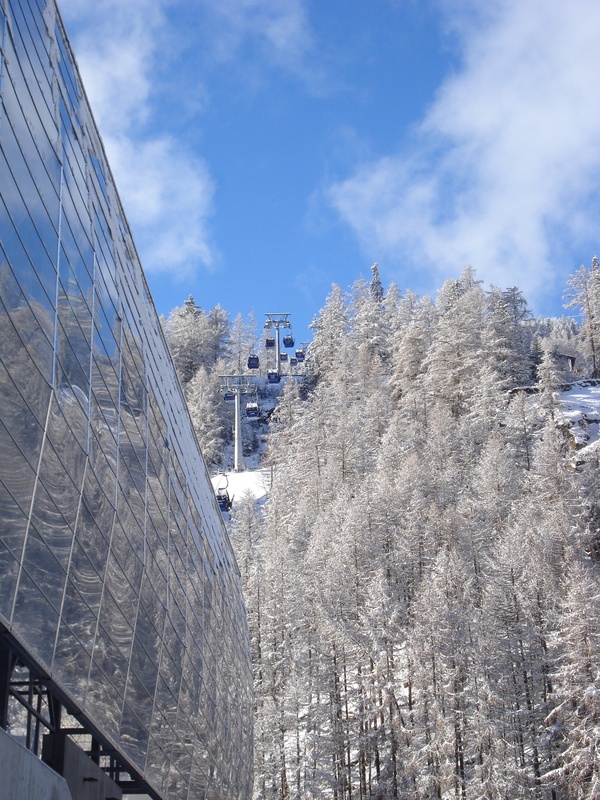 Ski lifts also take you to high places and stunning views. And then there are the restaurants and mountain huts, the Apfelstrudel and Germknödel, the blaring Tyrolean music and Europop. Somehow the sense of concentrating on just a few essentials comes to the fore – eat, sleep, play and turn your face to the sun. I’ll be doing it as long as my limbs hold out. Awesome indeed. Thanks, Marion. It just struck me this time how much being in ‘Europe’ was different from when we were at university.